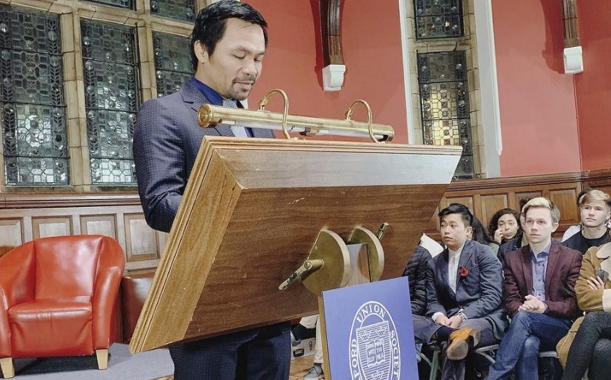 Senator Manny Pacquiao delivered his speech at Oxford University in England on Tuesday (Manila time) as he was invited as a guest speaker. 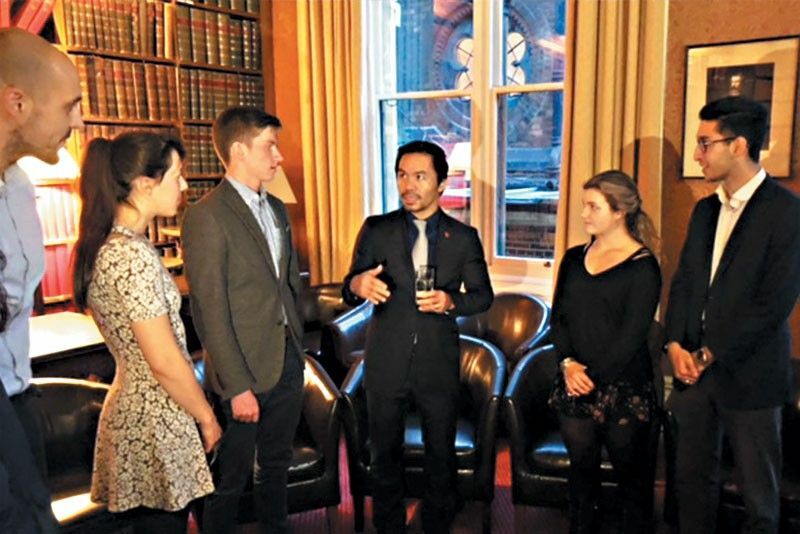 The politician and professional boxer Pacquiao just can't say no to Oxford as he was invited to the annual Town vs Gown Boxing event taking place in the Debating Chamber, which is organised by the Oxford University Amateur Boxing Club. Pacquiao's speech entitled “Dreams Do Come True,” narrates his humble beginnings and the trials he faced before becoming one of world sports’ leading legends. “I have fought some of the best fighters in history. And yet I have to admit, as I stand before you, I am intimidated when I think of the kind of main event headliners who faced you over the years: Sir Winston Churchill, American Presidents (Ronald) Reagan (Richard) Nixon and (Jimmy) Carter, Mother Teresa, the Dalai Lama and Sir Elton John,” said Pacquiao, who is boxing’s only eight-division world champion. Pacquiao has inspired the students of Oxford as he recalls the typhoon Haiyan(Yolanda) and Marawi City after the military takeover. “If you ignore the odds against you…and as you are taught here at this magnificent institution – never, ever quit. Think of David and Goliath. Look at me. I am not very big and I never had five smooth stones to throw at any obstacle, but determination is a power tool. I won a lot fights,” he said. Obviously slighted by criticisms about his lack of education, Pacquiao insists that he has something other politicians cannot boast of having. Founded in 1815, the Cambridge Union is steeped in history, being the oldest debating and free speech society in the world, and the largest student society in the University of Cambridge. It too has hosted an impressive list of world leaders in every field, including Margaret Thatcher, Theodore Roosevelt, Stephen Hawking, Buzz Aldrin, Antonin Scalia, Ian McKellen, and Sebastian Coe. The Cambridge Union announced on Friday that Manny Pacquiao, a prominent Filipino boxer and controversial politician, will speak in the debating chamber on Tuesday. Speaking on the decision to invite Pacquiao, the Cambridge Union said, “that there is no other practical opportunity in Cambridge for students to regularly challenge individuals face-to-face whom they disagree with, and to hold high profile public figures from around the world to account is central to our intention to ensure a wide variety of viewpoints”.